I've known Bart Beaty for about as long as I've worked in comics. I consider Dr. Beaty the best writer about European comics going, certainly the best in English. We worked together on his column "Euro-Comics For Beginners" at The Comics Journal, and I consider his "Conversational Euro-Comics" the crown jewel of this site. ECFB was an important tool for many English-language readers in re-discovering European comics. 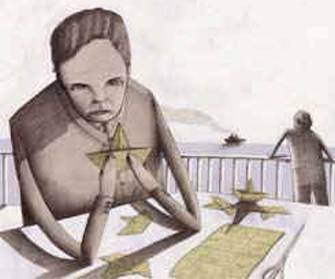 This came as a new generation of creators began to surface and followed a period when a few writers in the USA had basically dismissed the continent as a land of kids books and pretty, genre-soaked entertainments. It's through Bart that I found out about many cartoonists I have since made a regular part of my comics reading: people like Fabrice Neaud, Lewis Trondheim, David B., Dupuy and Berberian, Joann Sfar, Thomas Ott, Blutch and Baru. 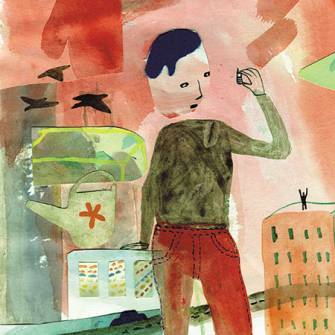 In his book Unpopular Culture, Beaty describes the rise of a new breed of author-driven comics within the greater European comics industries, and paints a compelling portrait of comics as cultural expression. Not only is Unpopular Culture authoritative in a lot of ways as the English-language description of the great period in European comics that is the last 15 or so years, but Bart's a funny and smart reader of comics in general. 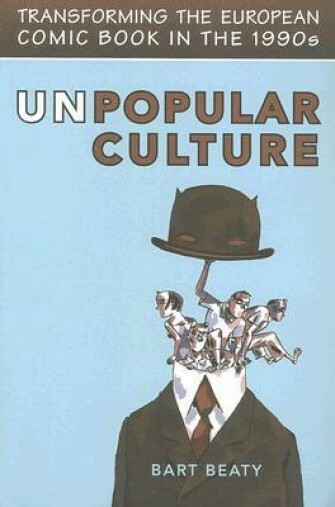 His throwaway observations are worth more than some people's entire columns, and for that analysis and the way Europe can be used as a mirror to learn things about North American comics, Unpopular Culture is one of the better books written about English-language comics currently on the stands. It's that good. I know that there are a lot of potential problems taking this space to interview one of the site's columnists, but I really dig Bart's book and I thought an interview would be a good feature to run the Sunday of San Diego Con when I and many others are on the road. Anyway, I hope you enjoy our conversation, and I thank Bart for taking the time. TOM SPURGEON: There's one thing I've always wanted to ask you. What does your comics collection look like? BART BEATY: I have two collections. In my basement are about 7000 American pamphlet-sized comics which are the result of a quarter-century of reading these things. All the usual suspects for someone of my generation. Long collections of Daredevil, X-Men, and Amazing Spider-Man from when I was a kid, and Yummy Fur, Eightball and Love and Rockets from when I was in university. Upstairs, in our dining room, I have two walls that are floor-to-ceiling covered in more contemporary comics. Two of those shelves are American material, five are French and one carries everything else: Portuguese, Dutch, Spanish, Italian, German, and so on. All the comics that I can only sort of read, or, in the case of the Finnish comics, which I can't read at all. I've arranged all the work alphabetically by the artist, which seems to work in terms of being able to locate work quickly. I probably have about 1000 comics on those shelves, which were the basis for this book. I read 1000 but wrote on a small fraction of that. SPURGEON: Would Unpopular Culture have happened outside of academia? BEATY: I don't think that there is any chance at all that this book would have been written if I didn't have my day job at the University of Calgary. It's possible that a different book would have been written, but not one where I use the term "heteronomous principle of the marketplace" on multiple occasions. The genesis of this book was a desire to take the writing that I was doing in The Comics Journal on European comic books to the next level, by tying it to larger theoretical issues that have informed my scholarly work more generally. It really came from a desire to marry my work life and the writing that I was doing as a hobby, but that necessitated writing in a more theoretically informed manner. SPURGEON: For everything else that it offer, has academia been a fruitful platform for you when it comes to writing about European comics? BEATY: I can't complain at all, really. This book was funded by a substantial three-year grant from the Social Sciences and Humanities Research Council of Canada. I'm incredibly grateful that SSHRC was positively disposed to the project and didn't simply say "Oh, comic books, that's not worth studying." SSHRC grants are extremely competitive, but I've never had any sense from them that they look down on comics. And their support really strengthened the book substantially by allowing me to spend six months in Europe over three summers, talking to artists and publishers, seeing stores and exhibitions, and buying books. Without that support, this would've been a very different book, and probably not nearly as interesting. SPURGEON: How much has writing about European comics in commercial outlets -- such as they are -- changed the way your academic writing has developed? BEATY: I think that writing in non-academic outlets has really made my academic writing a lot stronger. Writing is a skill that requires practice, and too many academics forget that. They write a dissertation, which is like running a marathon, but then they stop for a few years and find it hard to get back up to speed when it comes time to write a book. But if you ran a marathon and then didn't run again for three years, you're not going to do well in the next marathon, it's going to be a tough slog. So writing comics reviews and the columns that I write for Avenue Magazine in Calgary help keep me in shape, so to speak. It also allows me to test a lot of ideas. There are bits in the Dupuy-Berberian section of Unpopular Culture, for example, that were developed first in The Comics Journal and other places that I've written about those guys. Same with the section on Trondheim, Comix 2000, and pretty much the entire chapter about the avant-garde seems like a re-purposed "Euro-Comics for Beginners" greatest hits collection. I'd say that my comments on Donjon in the book are almost verbatim the same as what I wrote about the series in TCJ. SPURGEON: Do you have to switch voices? BEATY: Very much. 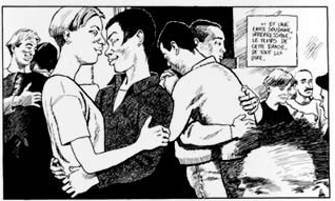 I try not to say "heteronomous" on Comics Reporter. The expectations are totally different. One requirement of my SSHRC grant was that I publish a book with a scholarly press. Those books are peer-reviewed, that is, they are read by experts in the field who provide the press anonymous feedback on the question of whether the scholarship is sound. Those reviews can render a completed book totally unpublishable if the referees declare the work not sufficiently sophisticated. So, in this book I'm writing first and foremost for my academic peers. That's very different than writing reviews of books where I'm trying to make an argument about whether someone should bother to read something or not. As a critic/reviewer I sort of see myself as a tour-guide, pointing out the highlights in a sea European publishing, but as a scholar I see my role much more in terms of an analyst examining the larger social questions that the success or failure of some of these books bring to light. As an academic, I'm asking questions about what the success of Persepolis implies about immigration in contemporary France. As a critic I'm concerned with whether or not it's an interesting read. SPURGEON: So what does the success of Persepolis say about the changing face of European immigration? And given the new levels of success she's likely to see because of the film, how do you see her as a phenomenon and as an artist? BEATY: I walked right into that one! 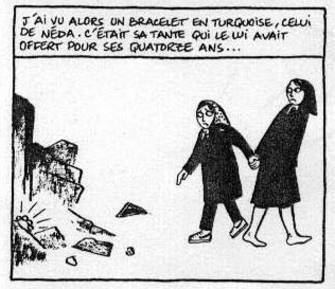 Glibly, I'd have to say that if Marjane Satrapi had not existed in real life at this point in time, the French would've had to invent her. So much recent discussion in France has been about French identity and new immigrant populations, particularly Muslim immigrants. These discussions have flared up around the riots of 2005, this year's presidential election, and, in 2004, around the decision in France to ban the wearing of veils in French schools. Satrapi, whose book talks extensively about the politics of the veil that she was forced to wear during the Islamic Revolution in Iran, was quickly caught up in the debate. She came out opposed to the veil but also opposed to the law that had been proposed by Jacques Chirac, a pretty nuanced position born out of her own experiences (a good article in The Guardian provides her position). I think for a lot of French critics, Satrapi is the "good" middle-Eastern immigrant. She speaks French, is dedicated to a secular society, fits in nicely with notions of Frenchness (although she is still very critical of many aspects of French life). She's a model of integration. And her work touches on so many issues that are so important in France right now: identity, personal history, and so on. I don't want to seem to suggest, however, that she only has this platform because of the politics of who she is. I think that the work has to have value for people to respond this strongly to it, and I think that she is an intelligent and important voice. That said, there are other intelligent voices out there in similar situations (I think immediately of Yvan Alagbe), who are far less well known, and I think that part of that disparity can be attributed to stylistic differences. Alagbe's work is less traditional than Satrapi's, and I think, in part, that accounts for the different ways that their work has been received. SPURGEON: Would writing about comics have been different for you, do you think, if Mark Nevins had written the initial Journal column with you as we had intended? BEATY: Mark's a really good writer, so he might have pushed me to raise my own game even higher. Actually, I owe a ton to Mark, and not just because he had to drop out of that Journal gig. Mark is the person who first invited me to Angouleme, and who introduced me to many of the artists that I now write about. All of those initial contacts came through him. But it was really the Journal connection, which came through you as editor, that facilitated all of this. Having written on European comics for the better part of a decade at TCJ meant that when I went to research this book I wasn't just some Canadian academic pounding on publisher's doors across Europe, but was actually someone with a track record and a certain degree of name recognition within the world that I was writing about. The Comics Journal really opened a lot of doors for me, for which I am extremely grateful. SPURGEON: Say you were talking to one of this site's readers who was flipping through the book and saw the weight it gave to Lewis Trondheim. How would you describe Trondheim's central importance to your conception of European comics? BEATY: I didn't want to give Trondheim his own chapter when I started writing. I didn't want to give any artist that much attention, and set them apart like that. So I planned to talk about his work when I talked about L'Association, when I talked about autobiography, when I talked about experimental comics, when I talked about big series like Lapinot and Donjon. And then it didn't make sense to not give him a chapter. Basically, everything that I wanted to cover in the book I could do through Trondheim because he is so massively prolific and has worked in so many diverse styles. So he became a good case study to sum things up with. My one regret about the book is that it went to press just before Trondheim won the Angouleme grand prize, since obviously that would have been the fitting coda -- Trondheim winning Angouleme but also leaving L'Association. Sadly, scholarly publishing is very slow, so I couldn't make those changes. Having said that, Trondheim has been very central to shaping my way of thinking about this subject precisely because he balances the experimental and personal side that is emerging so forcefully now and the traditions of the album series that has dominated Franco-Belgian comics for generations. He really does exist in both worlds, which makes him fascinating. I can't think of a comparable American cartoonist who can do both things so fluidly. My book is really interested in the shift from the one style of comics to the other, so Trondheim is really apt because of that. SPURGEON: How has the book been received by European academics? By European cartoonists? BEATY: I'm pleased with the way that it has been received by most of the cartoonists that I've heard from. I've had some really interesting discussions about it, and no one has told me that I'm completely wrong. Yet. Maybe they're just waiting. A lot of the complaints about the book have been of the "I can't believe you don't talk about Artist X" variety, which there's not much I can do. There's no effort in my book to be comprehensive about, say, Italian cartooning in the 1990s. It's just not the book that I wanted to write. This is really seven related essays about topics that arise from the small press revolution in Europe, not a complete checklist of all the authors and books involved. SPURGEON: Has any reaction to the book surprised you? BEATY: A number of French readers point out to me that this notion of the "small press" is an idea that is alien over there, it's just not a term that gets used but is something imported from an American context. I think my failure to define the term has caused a bit of a problem for some readers. That's not a surprise to me, per se, so much as a disappointment. I should have factored that into my thinking and added those sorts of definitions. SPURGEON: Aside from Trondheim's symbolic ascension at Angouleme and his departure from L'Association, what are some other significant factors to have changed about the European comics landscape since you finalized the book manuscript? BEATY: There are a few. Manga is something that I don't talk about much in the book, although that one I acknowledge in the book itself, and it has just gotten stronger and stronger. If I were writing this book today, I would've dealt with that more concretely, probably through a figure like Jiro Taniguchi, an artist that I positively adore. The expansion of the number of books published each week, which is related to manga, is a constant fear for a lot of artists, and I don't think that the book really deals with the sense of doom that a lot of artists are feeling. If things collapse soon, people will look back and criticize me for being too naive in my belief that things are changing. It is always possible that a backlash is coming and that the pendulum will swing back, as it did in the 1980s after the creative expansion of the 1970s. I think one of the things that has not changed, however, is the next generational shift. One thing that my book is really about is this giant wave of cartoonists who were in their 20s in the 1990s and who kicked down a lot of our assumptions about what comics were or could be. Now some of those people are passing into their 40s and suddenly they're thinking "comics is a young person's game" and wondering how they're going to pay the bills for their kids. So I think that some of the energy of the movement that I wrote about will naturally dissipate or be redirected elsewhere. But I haven't really gotten a strong sense that the next generation has arrived. There are great next generation cartoonists, to be sure, but I'm not sure that they are feeling the same need to overthrow the generation that preceded them. There's a certain lack of revolution in the air right now, largely because I think that the comics scene is very permissive. 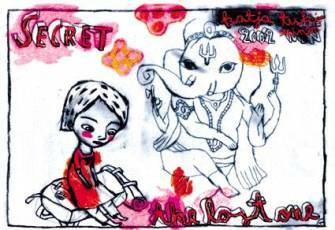 So you want to do a hand silk-screened comic printed on burlap sacks? Ok, that sounds good. There's very little that the market won't consider at the moment. It's tough to be a rebel when everyone is in an accommodating mood. SPURGEON: The rise of art comics in North America is as much a story of developing an audience for such comics as it has been the creators that make them. How has the audience developed for works like the one you talk about in Unpopular Culture? Is there a significant audience now and where does it come from -- passionate readers of all kinds of comics, former exclusively mainstream album readers, where? BEATY: I think that you're exactly right, it is about audiences. Sadly, I think that the answer to developing an audience is a very gradual and often painful process of trial and error. To go back for a moment to Satrapi, who has sold more than one million copies of Persepolis worldwide (four hundred thousand in France alone), her overnight success is hardly an overnight story. The foundation for her success was laid by autobiographical cartoonists like David B., whose followed in the footsteps of [Art] Spiegelman, who followed [R.] Crumb and Justin Green. It took 40 years to prepare the market for a blockbuster like this one. That's difficult work. At the same time, one of the keys to the movement that I've been writing about is its commitment to what the French sociologist Pierre Bourdieu calls "the long-term" approach. That is, initial sales might be small, but they're durable over time, they continue to sell and to sell. Over the course of years, those sales add up, and, if the work is good, it will be taught in schools and universities, and it will eventually become a classic (hopefully not before the artist is dead!). Bourdieu gives the example of Samuel Beckett's Waiting for Godot, which sold fewer than 200 copies when it was first published, but has now sold millions, while the bestsellers of 1952 may have sold a hundred thousand at the time, but where are they now? That may be cold comfort for a cartoonist thinking "I need to pay my rent today," I know, but it is a proven model. Many of today's best-selling comic book writers and artists will have trouble finding work in 20 years when tastes change (ask yourself what some of the big name superhero creators of the 1970s are doing today), but at the same time a lot of cartoonists who aren't making what they'd like today will still be reaping the benefits of their early work for generations. It's not a guarantee, of course, there are tons of great artists who may never find the audience that you or I would think they deserve, but 20 years from now a lot more people will be reading Seth than will be reading Dean Motter. I think that for the generation of cartoonists that I'm writing about there is a real belief that quality will prevail in the end, and so they are fundamentally and unwaveringly committed to their visions of what comics should be. SPURGEON: Can you talk a bit about the idea of conventions as a method of cultural organization? I thought that was really interesting. Can you further give a snapshot of what you feel are the differences in European and North American convention in terms of how each fosters or fails to foster art comics? BEATY: It may be the case that I privilege conventions and festivals because that is where so much of my interaction with European comics takes place since I tend to try to time my travel with these sorts of events. At the same time, it is clear to me that these events really are the heart of so much of what happens in comics. As many, many cartoonists have pointed out, comics is an isolating job, with conventions being one of the few places where artists get together and talk about their work, and talk with publishers and editors about upcoming work. I think that anyone who has spent anytime at a convention in the company of working cartoonists can come up with examples of deals that were struck over dinner or drinks. It's not really any different from a music festival, where two musicians might sit around jamming and then decide to contribute to one or the other's album. I was hoping to point out the important way that decisions about who is going to exhibit at which comics festivals has a really profound impact on how ideas move. When you bring an American cartoonist and a French cartoonist to a festival in Portugal, they're likely to start cross-pollinating ideas about what comics could look like. As for North America, I inevitably get yelled at when I offer the opinion that there are things to learn from Europe on how to run a festival that will attract a public beyond the already committed readers of comics. In the U.S. most shows from San Diego to SPX are destinations for fans and people working in the industry, and they don't do a whole lot to make non-insiders feel particularly welcome. The one time I took my wife to San Diego she lost interest in about five minutes because it seemed like a lot of noise. To be fair, the one time that I took her to Angouleme she lost interest too, but it took a full day for that to happen because at least there were exhibitions to look at. Angouleme and San Diego are both pretty hostile to art comics, obviously. But I think Haarlem or Luzerne or Bastia are much more supportive of art comics than are APE and SPX and MoCCA simply because they tend to place a greater emphasis precisely on the artistic rather than the commercial aspect of comics. SPURGEON: I was interested when you talked about countries that don't have a commercial structure that anchors the art form, like Portugal. How are such countries' comic scenes different for that missing element? BEATY: I was surprised when I first visited Lisbon about how much work there was going on. I left with a suitcase full of books by some outstanding cartoonists like Pedro Burgos, Filipe Abranches, Pedro Nora and literally dozens of others. I couldn't believe that I hadn't heard of so many of these people, other than a couple of books that had been published in French by Amok. But Portuguese is far from a dominant language in Europe, and they just seemed to be this tiny bastion of people putting out fascinating work that no one is really seeing. Like Hicksville, maybe. I think that two things happen in the case of a small commercial infrastructure, either people reach out to other scenes around Europe and internationally, or they sort of turn in attach themselves to a local arts scene in the fine arts and gallery scene, or in the traditional book stores and hope to make breakthroughs there. I'm struck by the fact that Optimal Press, in Sweden, publishes so many books in the pocketbook format, but it was explained to me that this was important to get bookstores to simply put them on store shelves as if they were traditional books. And there are always people in these countries fighting the good fight. Lisbon has the Bedeteca, for example, and Stockholm has Serieteket, both are comics libraries. But it is an uphill fight, absolutely. SPURGEON: For that matter, what differences between the French-language and North American comics scenes can be tied into what differences between their supporting commercial and distribution structures? BEATY: I think that a big difference between France and the U.S. in terms of putting out really experimental and personal material has been the system of grants that exists in France. I remember having lunch with Charles Berberian and some American cartoonists at SPX a few years back, and the Americans were complaining about not being able to fund a project that sounded very interesting. Charles just said, "Well, why don't you get a grant?" And they asked from whom, and he said "Don't you have a Ministry of Culture?" I think he was stunned to learn that there isn't one. But if you look in the front of all those books from L'Asso, you always see a thanks to the Centre National du Livre, and those kinds of funding sources have really allowed a lot of work to happen that probably would not have otherwise. Of course, in the past few years, there has been a real narrowing of the differences between Europe and North America, with the exception of the grants. The big difference used to be the tradition of serializing everything in the U.S., but now so many publishers have given that up in the pursuit of the bookstore market. This is a really important change and one that I think will allow a lot more interesting work to come out. I'm still surprised by how thorough the change has been. I haven't bought a single pamphlet sized comic since Cerebus ended, but I still bought three new books this week (Fletcher Hanks, Rutu Modan, and Paul Hornschemeier). I think that the fear in both markets is that the bookstore thing might collapse. The biggest concern I hear these days is about display -- that a book might have only a week or two at the front of a store on display before it is displaced to the shelves, where people are less likely to find it. That's something that has to do with the massive scope of comics production at the moment, and it might not change until there is a contraction in the market. That might happen if the manga market constricts or collapses, but I don't see too much evidence that that is imminent. SPURGEON: Can you talk a bit more about your take on European autobiography? 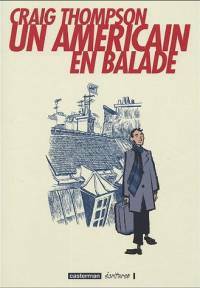 Why is it that North America hasn't yielded as many significant autobiographical works since Maus as the French-language scene? BEATY: I want it noted that you said that, so I don't hear from American autobiographers, of whom there are many, many great ones! That said, I'm not always sure why Europe turned out so many great autobiographers in contrast to the U.S. I think that one of the differences is a greater level of self-reflection and less straight reportage. A lot of North American autobio material is very story driven, even among the greats (I'm thinking of Joe Matt or Joe Sacco). Whereas if you look at Epileptic or Fabrice Neaud's work, it is much more introspective and uses the medium in a more expressive manner. I don't think that is a function of these artists being European so much as it is that they set a very high standard for the form, and now subsequent artists feel a need to try to match their accomplishment. SPURGEON: Is there a great small European scene that no one talks about? BEATY: I'm really fascinated by the Finns, and I'm sad that every time I've hoped to visit Finland things haven't worked out. The couple of cartoonists that are sort of well known from there -- Matti Hagelberg, Pentti Otsamo, Jenni Rope, Kati Kovacs, Katja Tukiainen (and none of these are exactly household names in the US!) -- all impress me as having highly individual styles. Tukiainen does work that really floors me -- I buy her work even in editions that I can't read just to look at the images (fortunately she's starting to become more widely translated into languages I do read). But there is also what seems to be a great deal of activity around a number of small-press anthologies there. Tommi Musturi, himself a really interesting cartoonist, edits Glomp, the latest issue of which could probably pass as Kramers Ergot #7 if you didn't know any better. Napa, which is edited by Rope and Jussi Karjalainen, is also always really high quality. There are probably half a dozen or more others that I'm slighting off the top of my head. One thing that is great about this scene, though, is that they are out promoting themselves. No one reads Finnish, so they include subtitles in their comics. They get out to the festivals, so that I frequently see Johanna Rojola (who basically read me her new book, Tati Jaksaa Heilua, at Angouleme), Tommi Mutsuri, and Kaisa Leka around promoting their work, and that of their colleagues. And, of course, Ville Ranta seems poised to have a big breakthrough, having done a book (Celebritiz) with Trondheim, and a recent translation from Ca et La (Papa est un peu fatigue). I get the sense that there are more first-rate cartoonists in Finland than in Canada, but that they're sort of just up there doing their own thing. SPURGEON: In your conclusion, you discuss JC Menu's theory of co-optation, the notion that the achievements of comics like L'Association's have been co-opted by bigger publishers and certain lines. Something I've never been able to understand is the mechanics of how this is supposed to work. In Menu's view, what does the existence of of French-language edition of Blankets really do to the L'asso books? What happens that is harmful? Is it a perception issue? Does he feel like people will develop worse taste for viewing this material as avant-garde? Does he feel like people will buy Thompson instead of Blutch? Why is the existence of work that he feels fall short of what the best comics do more harm than work that's completely absent of every value he holds? BEATY: Voltaire's maxim that "better is the enemy of good" probably applies. That's a sentiment that Gary Groth has used a lot in The Comics Journal, and Menu is a lot like Gary in his rhetoric. Without trying to put words into Menu's mouth, I think he sees the very real possibility that the big publishers could wipe out the movement that my book talks about. Here's the nightmare scenario: Big, well-financed publisher X comes along and says "Hmm. These small press guys get a lot of good reviews and critical acclaim, and some of them make some money. I bet we could sign them up and maybe have the next Persepolis on our hands." Certainly Big Company X (BCX) could probably outbid L'Asso for the talents of a lot of cartoonists. But will BCX sign up everyone? No. They would want the biggest names, the artists with the best chance of breaking through. That would leave L'Asso and the other small press publishers with all the real difficult material, and likely not enough revenue to survive. The success of Persepolis funds a lot of L'Asso's riskier material, just as the success of Peanuts funds a lot of what Fantagraphics can do. If Satrapi left, L'Asso would have a big problem, maybe even a fatal one. So there is that predatory sense of the big publishers coming after the most popular small press artists. I don't want to name names, but some of the figures I've heard have been really shocking. It's the same with, say, Pantheon in the U.S. Many of your readers are probably thinking, "Well, tough, that's capitalism", but if you think that way then you probably don't fully understand the dynamics of this particular art scene. Menu's position is that if we allow the head of the avant-garde to be decapitated, that might be it for the art form. I'm not a big believer in the idea that we can just leave this up to the market. Most of the best books I've read in the past few years have been ones that may never a dime. It's precarious business putting out these books, so efforts to undermine that (as Menu thinks Casterman has done with Craig Thompson, for example) are going to be controversial. SPURGEON: What effect has the authored comics movement had on the mainstream beyond those comics talked about by Menu? Has there been an insinuation of authored comics values into mainstream comics above and beyond those works which resemble the fruits of that movement? BEATY: This is the other half of the co-optation movement, and something that I discuss with reference to Sfar, [Christophe] Blain and [Emmanuel] Guibert in the book, although Trondheim is a great example, and so are Dupuy-Berberian, David B., and others. In the mid-1990s the bigger publishers began recruiting some of the small press stars, many of those with fairly traditional graphic styles, to do traditional albums. 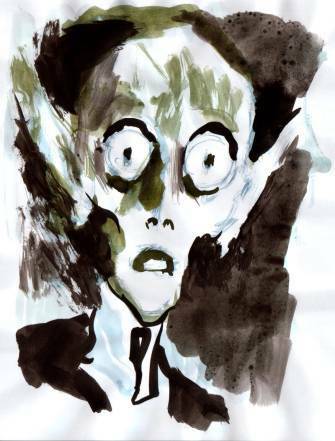 This work was very different from the small press work -- there is a big gap between Epileptic and David B. 's westerns, for example -- but there are some common affinities, and it did change the face of French comics, to a degree. It didn't displace the best-sellers, the [Jean] Van Hammes and Zeps, but it added a new dimension to the mainstream in the same way that Nirvana moving from Sub Pop to David Geffen changed the face of mainstream music in the 1990s. Neither ended the pop formula, but each opened new avenues for exploration within the mainstream. SPURGEON: Has there been a re-appreciation of any past comics or groups of comics? BEATY: Actually, this is the topic of a paper that I recently wrote for an anthology that's being edited by Mark McKinney. L'Asso, Cornelius, and Fremok have all been very active recently in terms of reprinting older work, which I argue is their way of rewriting the history of comics so that it draws attention away from the best-selling works of the past and refocuses on a number of forgotten works that more closely resemble the material that is published by, respectively, L'Asso, Cornelius and Fremok. It's interesting to me that Freon and L'Asso so clearly had artistic forefathers who they recruited into their fold, in Alex Barbier and Edmond Baudoin respectively. But L'Asso has really ratcheted up the reprints in recent years, with work by Gebe, Touis-Frydman, their recent book by Caro, several by Jean-Claude Forest. What is interesting about this tendency is the way that in reprinting forgotten work by, say, Forest (best known for Barbarella), L'Asso is able to suggest that there is an entire forgotten history of great artist-driven work that predated theirs, but which was ignored by the kind of commercial presses that Menu bemoans in Plates-bandes. SPURGEON: What would you hope, ideally, in terms of who the book reaches? BEATY: With scholarly books you sort of hope that you'll sell 300 copies! Actually, for the book there's a couple of audiences. I'd be really happy if it gets some attention from academics working in related fields who might not otherwise think of comics in this light. I was just at a film conference and talked with a couple of colleagues who do work on avant-garde cinema, and that led to a discussion of my work on avant-garde comics. They reacted like: "There are avant-garde comics? Who would have guessed?" So I hope to reach some of those people. Otherwise, I would like to hope that the book is readable for people with an interest in comics generally who might not know much about the movement I talk about. In that sense I could have called it "Advanced Euro-Comics" and targeted at the readers of my column. SPURGEON: What about your columns? If you could sit down with individual readers of this site and kind of make a case for what you hope they got from European comics, what would that be? An awareness of certain artists? A sense of the movement? An opportunity to look for more cartoonists they like? Is there an ideal reaction to your work? BEATY: I worry with my columns that I come off as too much of a cheerleader because I rarely review books that I don't like. I do sort of view the columns like I'm a tour guide, pointing out highlights and things that people might want to take the time and go explore on their own. I'd like people to remember that there's a ton of work out there worth checking out. It's why I read material about manga, which is an area that I'm lacking in. In terms of the ideal reaction, I think my ideal would be that a lot more of this work gets translated and is made available to people. When I started writing in the Journal, there was very little being translated. Now there's considerably more. All the credit for that goes to Gary and Kim, to Chris Oliveros, to Mark Siegel, to Terry Nantier and to all the other publishers who've taken the risk of putting this work out. Still, half the time when I go to write a column I want to start with the line: "For God's sake, someone publish this book in English!". 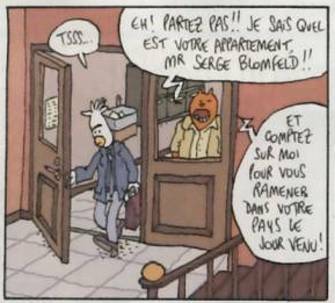 I'm not one of those guys who liked Joann Sfar more before Sfar became well-known here. I want to proselytize for the artists that I like, and if that helps them in any small way create a market for their work, that's awesome. Certainly the biggest highlight of my critical career came when I was told by a publisher that one of my reviews directly led to the decision to translate a book that I love. SPURGEON: I love the sound of your next couple of books. Can you talk about them a little bit, and what lies ahead on the research road? BEATY: I'm on sabbatical for the rest of 2007, and I'm hoping to finish the manuscript of a book that I've been working on for a few years about the relationship between comics and the traditional fine arts, painting and sculpture in particular. This isn't really about cartoonists who paint, Alex Ross and the like, but about why it is that comics were excluded from art history for so long, and why they're being included now. What has changed that you see Crumb in the Carnegie Biennale? That we get a Masters of American Comics show? That Seth's work is collected by the Art Gallery of Ontario? I'm really interested in the sorts of institutional relationships that exist around comics and the fine arts in sites like auction houses, galleries, museums and the arts press. I want to call the book "What if Comics Were Art?" but my wife thinks that's too inflammatory. After that I'm moving on to a new SSHRC-sponsored project about the relationship of comics and film. It's sort of the inverse of the current one, and looks at comics and the way that they are caught up in the entertainment complex. I don't really want to talk much about things like adaptation or formal issues, but am more interested in the relationship of, say, the Asterix comics to the films to the theme park outside of Paris. So the next two projects are basically comics and art, and then comics and entertainment. I've thought that after that I should do comics and literature, but by the time I'm done with these projects I might just have said everything that I want to say about this art form and it will be time to move on to something new.